Home from Austin, which means I had to actually make Muffin Tin Monday on a Monday for once. I so much prefer making it over the weekend and having it ready to post first thing, but oh well, not this week. On the plus side, make sure you come back for Kids Cook Monday later on! Faith made bentos over the weekend for her and Ben, decorated them, got out backgrounds, arranged them and made Shaun take pictures so I could post them on Monday! All her idea too! 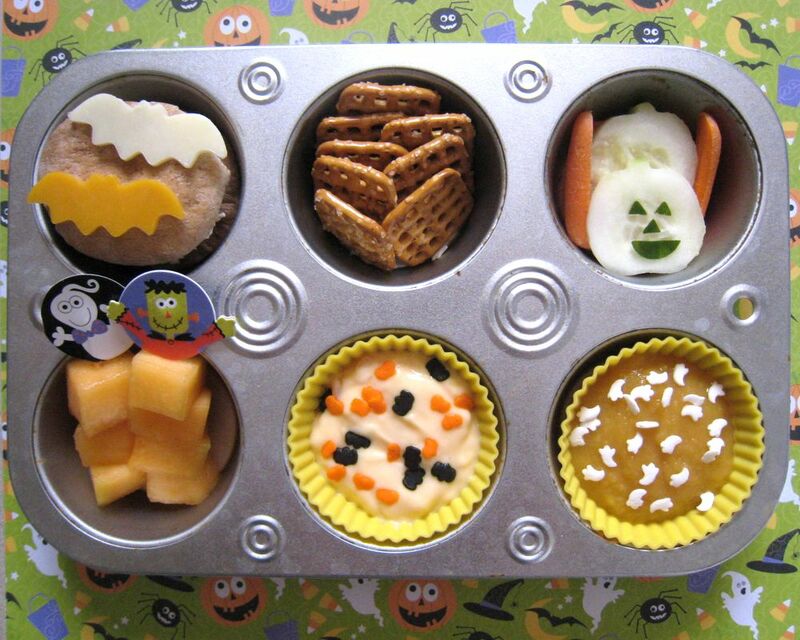 But back to Muffin Tin Monday, it's a Halloween theme! Faith was voting for pumpkin shaped cantaloupe but we already have a half cantaloupe diced in the fridge, so we'll have to cut into the new one later this week. JUst found your site today off MTM. When my Ds and I saw your blog we both screamed wow!. LOve all the cute ideas. I wonder if I could ever do the Bento thing. My DS is pretty picky. I am not sure I am that creative. Thanks for all the cute ideas. you will have to dish all about Bloggy Boot Camp!!! Can't wait to hear about it. Sucha cute tin today! Are those bat sprinkles? Ack! so fun! Great tin! I love the bat and ghost sprinkles! @Michelle, I will! Have to link to a few other awesome recaps on Twitter too. I love the cucumber idea! Too cute! When I saw the cucumber pumpkins, I was most impressed, especially as I tend to squash those things into mush (blush). One of the things I like best about the tin (and your other meals too) is how well you create/imagine concepts out of food - e.g. the rickety-gate pretzels. Turning something ordinary into a totally different "item" is special.